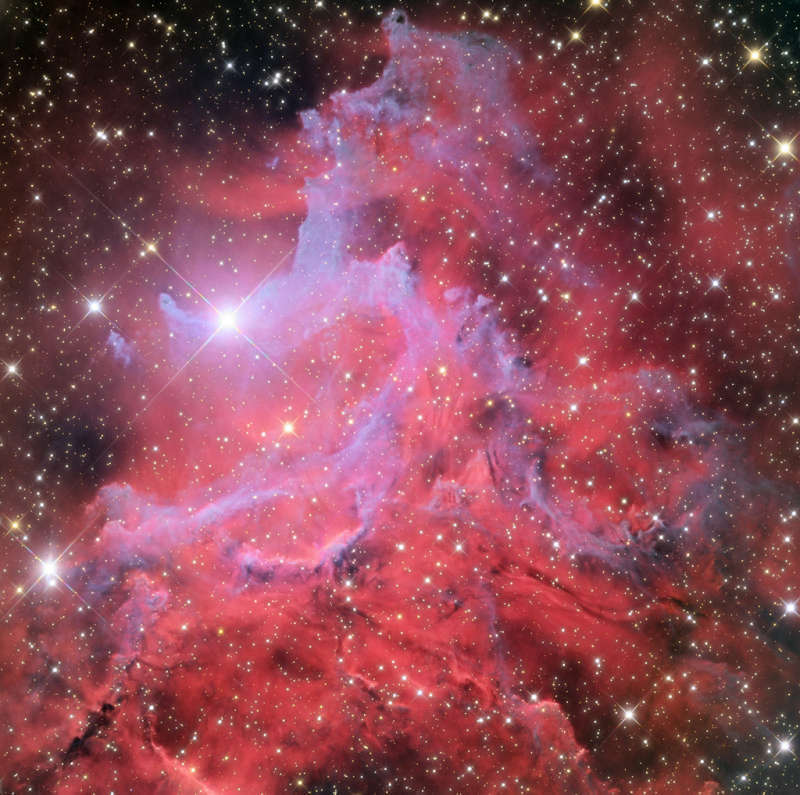 Explanation: A runaway star lights the Flaming Star Nebula in this cosmic scene. Otherwise known as IC 405, the Flaming Star Nebula's billowing interstellar clouds of gas and dust lie about 1,500 light-years away toward the constellation of Auriga. AE Aurigae, the bright star at upper left in the frame, is a massive and intensely hot O-type star moving rapidly through space, likely ejected from a collision of multiple star-systems in the vicinity of the Orion Nebula millions of years ago. Now close to IC 405, the high-speed star's ionizing ultraviolet radiation powers the visible reddish glow as the nebula's hydrogen atoms are stripped of their electrons and recombine. Its intense blue starlight is reflected by the nebula's dusty filaments. Like all massive stars AE Aurigae will be short-lived though, furiously burning through its supply of fuel for nuclear fusion and exploding as a supernova. The colorful telescopic snapshot spans about 5 light-years at the estimated distance of the Flaming Star Nebula.